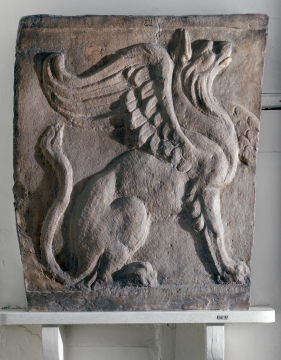 Beneath a plain-fillet moulding strip and above another similar moulding, a lion-footed griffin sits right, head erect and back, his off-wing protruding in profile in front of his chest. From the left-hand (as viewed from the front panel) end of a large sarcophagus. Carving such as this is hard to date more than in general terms, for while sarcophagus fronts change radically over time their ends are more stereotyped and less sensitive to stylistic trends. There are, of course, many other comparable examples on vastly differing classes of sarcophagi , see also note to Soane M560 (Vermeule 312). 1 S. Reinach, Répertoire de Reliefs Grecs et Romains, Paris, 1909-12, Vol II, p. 470, figs. 2,3,4. 2 G. Hanfmann, The Season Sarcophagus in Dumbarton Oaks, Cambridge (Mass. ), 1952, p. 177, no. 475, dated third quarter of the Third Century. 3 Nos. 20, 22; 1364, 1366; W. Amelung, Die Skulpturen des Vaticanischen Museums, Berlin, I, nos. 235a, 239a, pl. 36. Description of Sir John Soane's Museum, 1930, p. 74, fig. 42 (Upper left). P. Thornton and H. Dorey, A Miscellany of Objects from Sir John Soane's Museum, London 1992, fig. 60.